It might have been called pot luck in the past, but let’s call it gourmet hamburger helper now. Having thawed almost an extra pound of ground beef, I was now faced with the unexpected problem of what to do with it. In the search for that answer, by systematically going through the pantry looking for something that might be complementary, I found about a 1/4 pound of unused egg noodles. Looking further I found a can of Campbell’s Chicken Gravy. This proved to be my salvation. On the back of the gravy can was a recipe for Oriental Chicken. Now I never would’ve thought to put Chicken Gravy in anything even remotely approaching Oriental. But there it was. Now I had a solution for the extra ground beef and I’d clean out the pantry of the egg noodles and the chicken gravy at the same time. Plus I had found the inspiration (the recipe on the can) that would tell me what to do with all these ingredients. You might remember that the recipe was called, Oriental Chicken. Ground beef? Chicken? They’re both animal (as opposed to vegetable), so it was now Oriental Beef. The recipe called for the final mixture to be placed over rice. But noodles were what I had, so starch for starch, we’re now placing the final mixture over noodles. Unfortunately, a quarter pound of noodles wasn’t going to cut it, so, with additional searching, I found an open box of bow tie pasta. That would get me up to about a half pound of starch to serve as a base. The recipe also called for broccoli flowerets. You guessed it, didn’t have any of them. So into the freezer where I found a 12 ounce package of frozen “Italian mixed vegetables”. So there it was; zucchini, tomatoes, snap beans, and a smidge of green peppers replaced the broccoli. 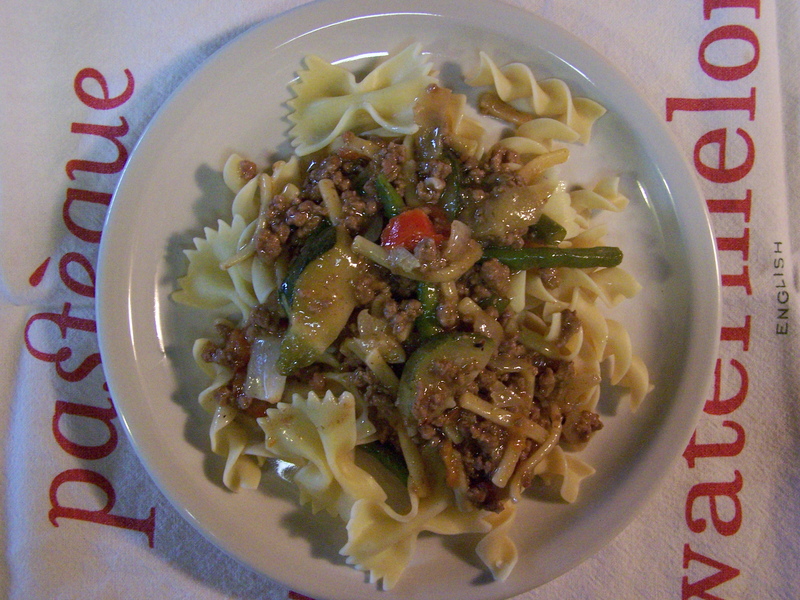 Here’s the final recipe, Oriental not-chicken with Italian-like vegetables over multi-nationality noodles. Or, as it turned out to be, gourmet hamburger helper. First get the noodles started by putting some water in a pot and starting it on its way to a boil. While that’s heating up, put your olive oil in a frying pan of some sort and start heating that up on low. I used a bowl-shaped flat bottom wok type pan for this. I figured it was Oriental? Since I have an electric stove, a real wok has never worked well for me. This bowl-shaped thing does a pretty good job, even if it does have a non-stick coating. Chop the onion coarsely. Raise the heat, crumple the ground beef in the frying pan add the onion and start cooking. Add salt and pepper. Stir as needed. You’ll know, we hope, when the meat is done. Put the noodles in the now boiling water. If you mix your noodles like I did, first kick yourself for being like this, then figure out which noodle cooks longest and start that first. When the timer is down to the cooking time of the other noodle type, put those in the boiling water. In my case it was about 12 minutes for the bow ties and about 7 minutes for the egg noodles. When the meat is about done and most of the moisture has cooked off, add the frozen vegetables. If they were thawed before adding, it would make more sense. But sense and time was not to be had today. Cover the pan (optional) and cook the vegetables until they’re done. Probably 5-6 minutes. Add the chicken gravy, soy sauce, ginger and chopped garlic. Mix everything up and allow to reheat to a simmer. Somewhere in all the meat/vegetable cooking, your noodle timer should have gone off. So hopefully, you let the meat mixture cook on its own and drained your noodles, hitting them with a little skirt of cool water to stop cooking. At this point everything should be cooked and ready to go. Place some noodles in a plate, spoon over the meat mixture. Eat. I don’t know if it’s Oriental, but it turned out much better than I expected. And much better than any of that boxed stuff sold to go along with a pound of meat. It was quick, relatively easy, and has the added benefit of clearing your pantry of things you don’t want to sit around for another two years. Now, what do I do with the companion can of Chicken Gravy I just found hiding behind the jar of Home Style turkey gravy? Maybe some kind of falafel thing since I also have a can of garbanzo beans back there somewhere behind who knows what? This entry was posted on 07/24/2010 at 10:35 and is filed under Recipes, Recipes, food, cooking and related items. You can follow any responses to this entry through the RSS 2.0 feed. You can leave a response, or trackback from your own site.